British made Land Rovers played a key part in the killings in the Uzbek Andijan incident in 2005, Amnesty International has said. Almost 10 years after the massacre, the human rights group is renewing its call for an independent inquiry. 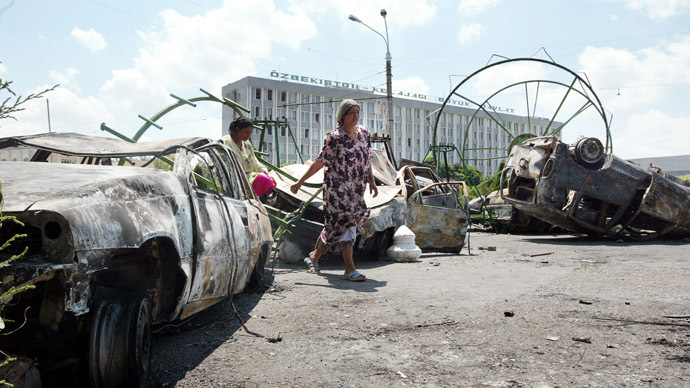 On May 13, 2005, hundreds of largely peaceful protesters were killed by Uzbek government forces without prior warning. Uzbek troops used UK-manufactured Land Rovers, “fitted with rifle clips and other military accessories, to travel to the scene of the massacre on 13 May, and to take cover behind the armored vehicles as they aimed their guns at unarmed civilians,” Amnesty International said. Although the Land Rovers were from a Turkish company and supplied by the Turkish government to the Uzbek authorities, around 70 percent of the vehicles were made up of British equipment. The British components were not listed as military, so the UK government had no control over their export and re-export. Amnesty International UK Arms Control Programme Director Oliver Sprague said: “A decade later this gaping loophole in the UK’s arms control system remains wide open. “We were promised action to ensure that the export of UK components like military vehicle kits would be properly regulated and that they wouldn’t end up in the hands of trigger-happy security forces like those in Uzbekistan. Pictures emerged after the massacre showing that Uzbek troops used Defender vehicles, designed by Land Rover, to fire on the crowds. More than 500 people were killed when Uzbek troops opened fire on them from two columns of armored cars. The Defenders were manufactured by the Turkish company Otokar but the chassis design and technology was British. Commenting on the case, Anna Macdonald, director of the control arms campaigns at Oxfam, said: “These vehicles are made from 75 percent British parts, but simply by assembling them overseas, a company can completely avoid British export controls. The human rights group is now calling for an independent investigation into the killings. The EU imposed an arms embargo on Uzbekistan in 2005 as Uzbek authorities rejected requests for an independent international inquiry into the Andijan conflict. In 2009, the EU lifted the arms embargo, a move that was strongly criticized by human rights groups. Uzbekistan’s location in Central Asia is of strategic importance to the UK, US and the EU. Multinational troops going in and out of Afghanistan also used it as a base. Uzbekistan is listed under “countries of concern” in the UK’s annual Human Rights Report. However, as the arms embargo was lifted, trade continues. Arms export licenses worth £7,405,718 between the UK and Uzbekistan were recorded in the Foreign & Commonwealth Office records for 2013.